Advance Tech Pest Management Services, Inc. has been serving the rolling hills of Central Florida since 1996, offering the highest-quality general pest control, termite control, lawn and ornamental pest control, and landscape consulting. We provide service to all of South Lake County and West Orange County, Florida, including Clermont, Minneola, Winter Garden, Ocoee, Windermere, Howey in the Hills, Groveland, Mascotte and the Four Corners Area. We are a locally-owned family business (the owner was born and raised in Clermont) and we emphasize quality, ethics, and good old-fashioned customer service in all that we do. With Advance Tech, you don't have some out-of-towner calling the shots. When you call us, you get to speak to an owner, which means that we can custom-design a plan that's right for you. Better still, because we're your friends and neighbors, you'll always have a friend in the business. And just because we're a small, locally-owned company doesn't mean we skimp on the "extras." We utilize the finest, most state-of-the art pest control and IPM products and methods available anywhere. We also have our own full-time, staff entomologist (Masters in Entomology from The University of Florida) who can identify tougher pest problems and design integrated pest management strategies to meet the needs of any residential or business client. 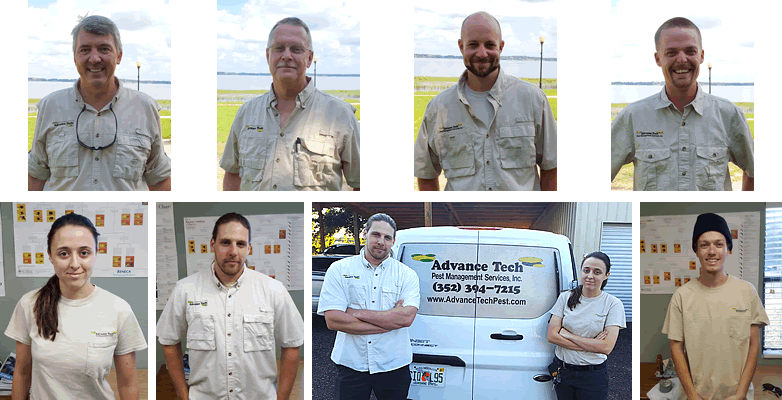 So whatever your general pest control, termite control, or lawn and ornamental needs, feel free to contact Central Florida's hometown experts: Advance Tech Pest Management. We're sure you'll be glad you did.